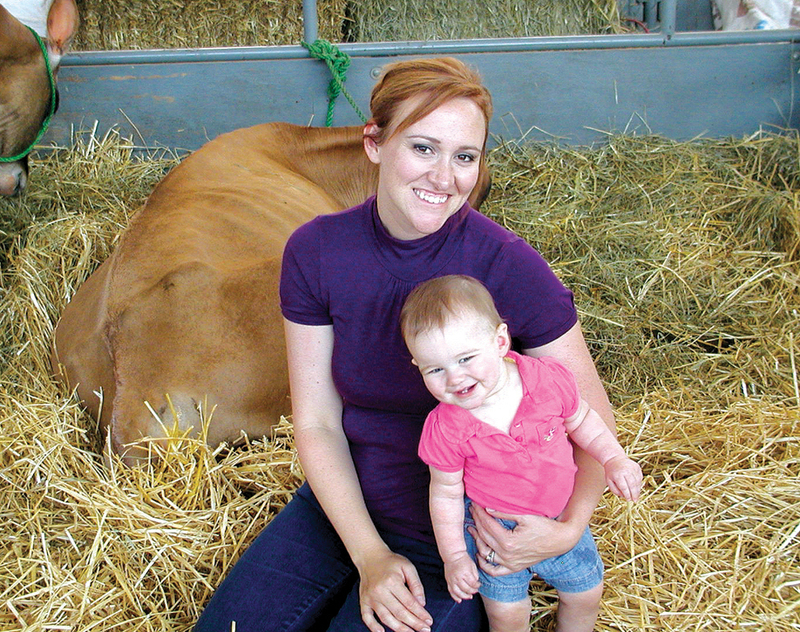 Hoosier Farm Babe : It's Easy to Love the Great Indiana State Fair! It's Easy to Love the Great Indiana State Fair! It's State Fair season and there is none better than the Great Indiana State Fair! This coming from a gal who grew up going to the Ohio State Fair. In fact, when I was just a couple weeks old, my mom and dad loaded me up for my first State Fair cow show. Start em' young I guess, just like my Miss Ray Ray below, age at her first State Fair cow show! But honestly, I do have serious love for the Indiana State Fair. It has all the qualities you look for in a fun, wholesome summer outing that the whole family can enjoy. Great food, concerts, educational exhibits, midway rides and carnival games and of course my favorite the livestock shows. This year's theme is the Year of Popcorn and who doesn't love popcorn. Pour on the butter and salt and I'm one happy and full customer! While the State Fair is well underway, there is still plenty of time to get down to the fairgrounds for one of the dairy bar's famous milkshakes, the Pork tent's delicious pork burgers or the Indiana Beef Cattle Association's yummy ribeye sandwiches. Or better yet, all three! And don't forget to check out the world's largest popcorn ball on display at the Ball State Ag/Hort Building. 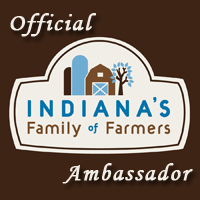 Beyond the fair food delicacies that satisfy your appetite, I'd encourage you to hook up with Indiana's Family of Farmers and their Recipe Trail, helping to feed the hungry, also receiving a useful popcorn-shaped memento. For each person who finishes the trail, IFOF partners with Feeding Indiana's Hungry to donate one pound of food to food banks across the state. Recipe trail travelers donated more than 3,000 pounds of food last year. This year's goal is 3,500 pounds, so 3,500 people need to go through the recipe trail to attain the goal. Participants collect recipe cards from the 10 locations around the fairgrounds and bring them to the IFoF booth at the DuPont Food Pavilion where they will receive their memento and get counted as a donor of a pound of food. The booth also features a chance to register for a daily popcorn giveaway and the grand prize of a chest freezer. · Start at any location and travel to the 10 destinations to collect recipe cards. · Visit the IFOF booth in the DuPont Food Pavilion with your recipes to be pick up you popcorn-shaped memento, be counted as a food donor and sign up for prizes. · Winners of the daily giveaway are selected by a random drawing at the close of each day of the fair. · One winner of the chest freezer will be selected by a random drawing on the last day of the fair. · Winners will be notified by email or phone. The IFoF recipe cards feature recipes from real farmers around Indiana and highlight Indiana’s commodities such as pork, beef, poultry, soybeans, corn and dairy along with an Indiana wine pairing. On the reverse, fairgoers will meet the farmer and read a personal story from his or her family. More information about the 2013 recipe trail is on the IFOF’s website (site updates in process). Other Indiana Family of Farmers activities include their booth in the DuPont Food Pavilion. For the second year in a row, the DuPont Food Pavilion will be a part of this year's State Fair. Along with hourly food demos on the Red Gold Kitchen, the Pavilion will also feature a retail store with more than 30 Indiana made specialty items available for purchase. Indiana's Family of Farmers is also a partner for the Habitat for Humanity home build on the State Fairgounds, a stop on this year's Recipe Trail. As part of this partnership, IFoF will donate a freezer and meat to fill the freezer for the new homeowner. Thanks to the farmers around the state who grow our good and who generously gave back. I know school is in session for many parts of the state, but I sure hope you can make it out to the Great Indiana State Fair, it's a fair worth seeing first hand, the best in the country and my personal favorite. It's about creating memories to last a lifetime and the State Fair is the perfect family venue for more memories than your scrapbook can handle!